Ellen White called Union "the western school." LINCOLN, Neb --- Controversy erupted today after Union College Professor of History R.J. Leemin alleged that Ellen White, the co-founder of the Seventh-day Adventist Church, was "directionally-challenged." 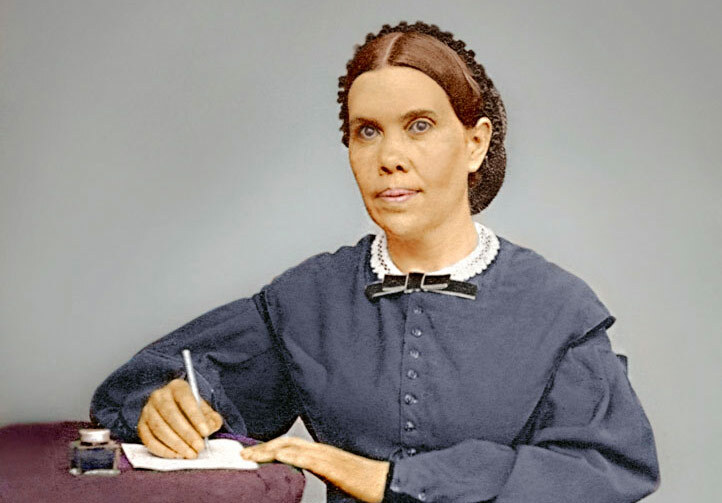 Leemin pointed to a statement by White in which she called Union the "western school" as evidence that the Adventist leader while "undoubtedly gifted prophetically, did not have a solid grasp on American geography." Leemin's students quickly voiced support for the professor's theories: “Clearly Nebraska is smack in the middle of America,” said loyal student Pete Ree. “I always just thought whoever wrote the Union anthem needed a word that rhymed with ‘best,' but Dr Leemin's theory makes a lot of sense." "Union's early administrators clearly didn't bother to fact-check Mrs. White. They opted to build first and see the ocean later," said Leemin, admitting that White was not entirely to blame for Union's confused geographical beginnings. "By the time they picked up on the fact that they were nowhere near the West Coast, they had spent a staggering $580 building a state-of-the-art campus with indoor and outdoor plumbing and it was too pricey to move." “West,” “Mid-West,” whatever. It’s certainly close enough for government work. I really like the Union campus. That’s pretty good if it was originally built with $580, with indoor plumbing to boot! This story make no senses. Ellen White’s lived in California long time. She was as far west as west can been. Obvious she know Nebraska is not the far west. Whoever write this story is not know what is they saying. Huo ndio mwisho wa hadithi. Kwaheri. Believe sevvy no has nothing better about to write. I no believe this ‘directionly challenge.’ He like invent news that is no news. He lose time by write crap. Debería escribir anuncios políticos para Ben Carsón. She probably copied that from some New Yorker where New Jersey is considered out west. She just plagerized the wrong source. So slandering her about her sense of direction is a terrible injustice. R.J. is surely disqualified from the 144,000, without some serious mental adjustment classes at the White Estate mansion. I sseulegiwa sseulegiui mulim e bulgwahada. Sevvy neun hibhab laeb gasawa gat-eun gachiissneun mwongaleul sseuneun jasin-ui sigan-eul hal-ae hal pil-yogaissda. Thanks, bugs. Now go feast on haystacks and Fri-Chik, out west in New York. The Pope changed foot washing for Catholics on January 21. It comes as a surprise to many Adventists because it is commonly believed that “only Adventists observe foot washing.” Pope Francis has changed the rules for the ordinance as practiced by Roman Catholics, announced Religion News Service (RNS) on January 21, referring to the annual Maundy Thursday service where the priest has washed the feet of Catholic men, and will now wash the feet of women and non-Catholics who are in attendance. Hey, Moonie-can you please provide a translation of your remarks? I only figured out the last word-something about “sda”. I even tried to read it backward-no results. The rest is mish/mash. Or as we say in Yiddish-“meshuganah”. Woe iz me. A long time ago, I visited Union College. For decades, it was the furtherest West I had been. I understand Leemin’s situation. Then, in the spring of 2015, I went a little further west by flying to sunny California. I never knew there was such a place. Never mind the San Andreas fault. I loved walking on the beaches of Laguna Hills, San Luis Obispo, Riverside, Corona, Venice, Dana Point, etc. I’m gonna go again in September 2016. Gonna surf them big waves, dude. Union is too cold for me. All the terrain is FLAT. I like diversity. Woe iz me!!!! Forget Union. There is something more important: Trump’s absence from last night’s debate proves that he is a little crybaby. The “veteran’s fundraiser” was a publicity stunt after Trump had a hissy fit because he was asked tough questions the he didn’t like in the first debate. That’s what reporters are supposed to do–ask tough questions of politicians. And it was a relevant question about women. but Trump is a wuss and couldn’t handle it. Trump acted like a spoiled little infant. “Oh, mommy, they weren’t fair to me! Boo hoo!” Hey Donald, life isn’t fair. Russia, Iran, and ISIS won’t treat you fair. What you gonna do – go crying to mommy and hold a fund-raiser for Africa when you’re supposed to confront the Ayatollah Komanchee? It’s all Megyn Kelly’s fault. How could someone so beautiful be so mean? How could she be so unfair to me? She has no sense of direction; she reminds me of Ellen White. WARNING: The Surgeon Generals have determined that consuming empty calories, large quantities of sodium, and massive amounts of sugar and fat is dangerous to your health. Sorry, but Little Debbies are not a healthy alternative to smoking or eating meat. I hope some of the previous commenters realize this is satire and not truthful…there is no such person as Professor Leemin at Union College and this article really made me laugh! Keep up the entertaining work! Santa no is real. He fake. Prof. Leemin really fake. Sevvy no has nothing better about to write. He like invent news that is no news. He lose time by write crap. Debería escribir anuncios políticos de hip-hop para Ben Carsón.